If you’re a caregiver, you always want to make sure that the senior in your care has everything they need to live safely in their own home. Additionally, if you are someone with limited mobility, you do not want to feel like you are burdening the people you love. Having a bed trapeze can be the difference between asking for help and getting up and down on your own. The best trapeze bar can change your life if you find something that works for you. We reviewed and tested several of them, and we’re breaking it down for you. This trapeze bar is durable and definitely gets the job done as you would expect. The only downside is the reach of the top pole, it could be a bit longer. This overhead trapeze bar is ideal for helping seniors move around easier when in bed. It also helps them get themselves out of bed with limited assistance from a caregiver, helping to prevent falls and other injuries. If you are a caregiver, this makes your life easier, and it also provides you with peace of mind in knowing that the person can move around if they need to. The bar itself is sturdy and includes a large base to ensure there is no risk of tipping. If you have a large bed,or if you’re on the side opposite the stand, it can bedifficult to reach the handle because the top bar does not extend across the entire bed. Therefore, we feel this product would benefit from a longer top bar to suit individuals of different heights as well as ability levels. Because the unit itself is quite large and bulky, it may not be a good fit for seniors with limited mobility. This bariatric floor stand is intended to help people move themselves around and get in and out of bed without needing assistance. This unit is heavy duty and built to last forever. This floor stand is an excellent option for bariatric patients and anyone who wants to pay to get the best product they can get. With a heftier price tag comes a more durable trapeze bar with extra length and a more stable base. For seniors aging in place, this product can be life changing because it gives them more independence and increased safety while taking stress off of their caretaker and loved ones. When you grab on to this trapeze, you feel that it will hold your weight with no issue. This medical trapeze is quite large and has a weight capacity of 600 pounds, making it sturdy and built to last.
. It is designed to sit behind yourheadboard so the hook is within reach while lying in bed. This requires you to keep your bed away from the wall quite a bit, but that is a small sacrifice to make for the security you gain as you age in the comfort of your own home. This trapeze bar is good and bad at the same time. It takes up a lot less space because it does not require a large base but it does leave a permanent mark on your ceiling and requires professional installation. This bed trapeze is different because instead of resting on a base on the floor, this one is mounted directly to the ceiling joists. This configuration has its benefits in that, If installed correctly, this unit is more durable and stable than most because it is built right into the ceiling. The downside is that it requires professional installation which could incur additional costs. For seniors, this unit is ideal as it also features two separate grab bars to help you get more leverage when you’re getting up. The handle and hook also run on a boom so you can slide it out of the way when you do not need it. This trapeze bar provides the support you need to live independently and safely. This unit is not quite as durable as some of the other options but you get a more affordable option that bolts directly to the bed frame so it stays out of your way. For this trapeze, the assembly is simple, and the weight capacity is up to 300 pounds.We do not recommend using this on a wooden bed frame especially if you are a larger person. This trapeze bar only fits a specific style of Drive Medical bed so unless you have that exact bed this unit is of no use to you. They do not recommend trying to fit it on any other bed. This trapeze for hospital beds is designed to fit a very specific hospital bed from Drive Medical. Make sure that you have the exact model bed that is on the listing or else it will not fit. This is a floor stand only and it functions as you would expect. It is versatile and can be installed to the bed in a few different ways. This unit contains the floor stand only. 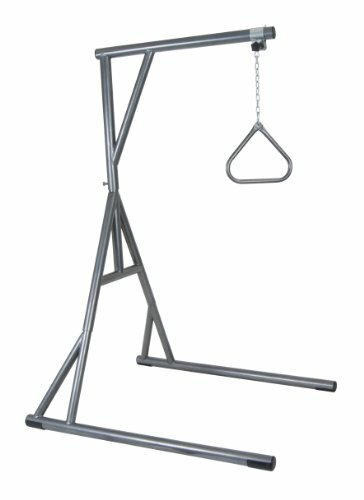 This is a great option if you have a trapeze bar that you like, but you would like to add a floor stand to that as well. For seniors, this is a great option because you can pair it with a bar that suits your individual needs, giving you the ability to live at home and function more independently. We recommend this one because it is durable and it comes with a few different options to accommodate your needs. You can leave it on the floor and slide it underneath the bed or you can brace it to the frame of the bed underneath for added support and height. 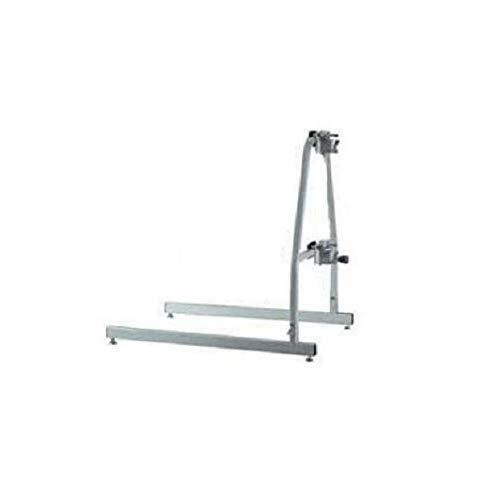 This unit is designed to mate with the Versa-Helper Trapeze and has a weight capacity of 250 pounds. Let’s be real for a second, this is a device that can be incredibly useful for seniors aging in place as it gives them independence where they would otherwise require assistance. It is important to note that it can be hazardous if it does not get installed correctly or you get a faulty product. In order to make sure that you get the best device on the market, let’s look at some of the things you should be looking out for before you make a purchase. We realize you cannot determine how sturdy something is by looking at a listing on the internet, but there are a few ways to figure out if something is durable or not. Look at the materials and make sure that it is thick steel tubing. If that information is not readily available on the listing, reach out to the company to find an answer. The material is the most important part and after that it is important to consider the base or mounting. If the unit has a base on it, make sure that the feet are long enough to reach across the entire bed underneath. The longer the feet, the more support you have when pulling yourself up. Lastly, pay attention to what is holding the grab handle onto the frame. Look for chain links whenever possible and try to stay away from straps. Over time, straps wear down and chain links will last much longer. They are usually stainless steel, so you do not have to worry as much about corrosion either. 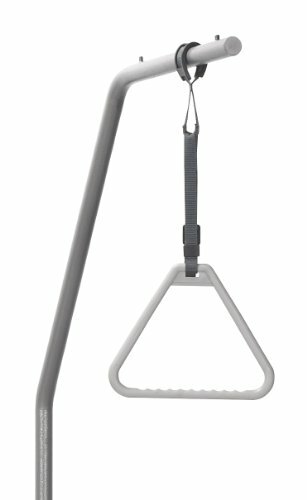 Besides safety you want the trapeze bar to make sense and be easy for you to grab, especially taking into consideration any mobility or flexibility limitations you have If it does not adjust to meet your needs, you may have to overextend yourself to reach it, and that could result in an injury or a fall. We want to make sure you get the perfect unit to meet your needs so that you can be safe as you seek independence at home. It’s best to get a unit that is adjustable, so you can make sure it is the perfect size for you. Make sure the unit has a wide range of adjustable features from the height of the bar to where it is positioned above your bed to ensure easy access based on your level of flexibility. This factor depends a lot on your situation. If you live at home with a caregiver and you are looking for a way to maintain your independence, then you want to pay attention to the overall size of the unit. Sometimes they are so large that you cannot even get out of one side of your bed anymore. Some heavy-duty trapeze bars weigh as much as 80 pounds so it is important to make sure that it is in a location where you can access it. 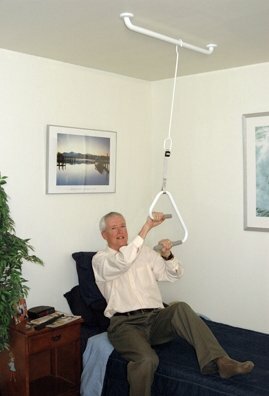 Bed trapeze units can be a great tool for seniors who desire to age in place and feel safe and confident in their independence. By ensuring that you have a safe way to get in and out of bed as well as a way to maneuver once you are in bed provides a great sense of safety. These units can prevent strains, falls, and nighttime anxiety for seniors who worry more intensely about their safety after dark. Whether a ceiling mount, bed mount, or free standing unit makes the most sense for you, we hope that the information we’ve compiled helps you in making the best choice.